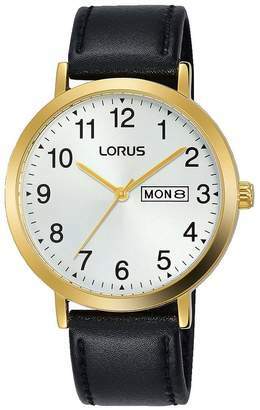 Lorus Lorus Silver Sunray and Gold Detail DayDate Dial Black Leather Strap Mens Watch Lorus Mens dress watch with a sunray white dial and easy read Arabic hour markers. Black leather strap with side stitching & SS pin & buckle. Day/Date box. Black hands & second hand. Easy read Arabic hour markers.